In the face of it, Ontario’s renovation industry is booming. Low interest rates make it easier for homeowners to borrow for larger projects. High real estate transaction costs from land transfer taxes, realtor fees and moving expenses make it more attractive for people to stay put and invest in their home. This combination adds fuel to the residential renovation industry, which represents $28.5 billion in annual economic activity in Ontario, making renovation a larger industry compared to new home construction. 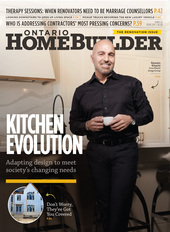 Evidence of home renovation’s trendiness can be seen on the small screen with a growing number of reality TV shows made and produced in Ontario and exported around the world. Yet, despite the fame of TV renovators and the sheer size of the industry, there remains a sense that sometimes governments don’t show the reno industry the same respect as their counterparts in the new home sector. The average home renovator is frequently the firm’s HR manager, accountant, sales department, after-market sales, designer and skilled trades person—sometimes all on the same day. And depending on the marital status of the couple they are working with, he or she may also be a part-time relationship counsellor. Having to juggle all these roles is hard—certainly harder than it looks on a reality TV show! Let’s not forget that in home renovation, the competition is the guy working under the table for cash and not paying WSIB or income taxes or applying for building permits. In this mixed environment of illegal and legitimate business, adding new costs, regulations and red tape means that guy doing a cash deal may get more of the business. This is why the renovators I talk to often shake their heads when the subject turns to apprenticeship regulations, the Ontario College of Trades or WSIB. There is a perception that government and other groups don’t quite understand their business. While new taxes, fees and administrative costs may be less cumbersome to deal with for large general contractors, home renovators often struggle with understanding the constant stream of new regulations that keep piling up. While both home renovators and general contractors may be driving the same model truck and are both considered construction managers, each is operating in completely different business environments. The Ontario College of Trades has been a target of criticism since it started operating in 2012. Opinions on OCOT split the construction industry. Some saw it as a body that would promote the trades and give professional recognition to tradespeople. Others viewed OCOT as a unionization tool for vested interests to gain jurisdiction against rival unions and the non-unionized industry. One of the college’s main responsibilities is ensuring that only licensed journeypersons and apprentices are the ones doing the work in the compulsory trades such as electricians and plumbers. Unfortunately, determining the work tasks a compulsory trade can be assigned is not straightforward and isn’t conducive to rigid definitions. But rigid definitions are precisely what OCOT inherited when it was created. The Scope of Practice (SoP) regulation, which defined work tasks that OCOT became responsible for, referred to definitions for trades that date back to the 1950s and 1960s—definitions originally written for training purposes; not enforcement. The outdated Scope of Practice only became problematic from a public policy perspective once OCOT was established. All of a sudden, the SoP’s took on additional meaning, as they provided the legal definition of what a trade is. This definition informed both the new enforcement division and adjudicative process for defining potentially new compulsory trades. For renovators, this was a problem because performing renovations happens to fall within the Scope of Practice for a general carpenter. While a general carpenter is currently a voluntary trade and doesn’t require a licence under OCOT, there was now a process for the general carpentry trade to become a compulsory trade. If that had occurred there was the potential that only workers with a General Carpentry Certificate of Qualification could perform renovation work. While some renovator members have that certificate, the majority do not. If general carpentry had moved ahead and successfully became a compulsory trade, this would have upended the entire renovation industry. Regardless of the transition rules that OCOT applied, home renovation as a compulsory general carpenter trade would have been highly disruptive, since changing a doorknob or window fixture would have required a general carpenter licence. In order to become a general carpenter in Ontario, a worker must apprentice for 7,200 hours and attend in-class schooling at a college or union training centre. Equally tricky is finding an employer that can hire an apprentice, with the current ratio of three journeypersons required to hire a single apprentice. The renovation sector’s concern is one of a number of concerns identified by OHBA and other stakeholders that successfully convinced the government that they needed to take a second look at how OCOT does its job. The province appointed Tony Dean to review the College of Trades and he embarked on a province-wide consultation tour visiting home builders’ associations across Ontario. Ultimately, Dean provided government and OCOT with 29 major recommendations that would change the way OCOT operates moving forward. After accepting Dean’s recommendations, the Ontario government introduced three major reforms through legislation that passed at the end of 2016 that OHBA believes are positive for renovators. First, the government now requires OCOT to develop a policy for the review of Scope of Practice (such as general carpenter) to see if the current Scope of Practice still make sense. This review recognizes that the SoP are often outdated and need a second look. For renovators, this should provide some assurance that they aren’t grouped alongside large unionized carpentry employers that have different demands. Second, the trade classification process now allows for elements of a Scope of Practice, including home renovation to be omitted as compulsory, even if other components of the trade become compulsory. This change should address the concern that if carpentry does move forward as a compulsory trade, installing a doorknob or window fixture doesn’t require a worker to go through a full apprenticeship. And third, OCOT must now develop a compliance and enforcement policy based around the risk of harm to workers and the public. This is a change from the enforcement structure of OCOT which currently allows enforcement to issue fines and penalties to non-OCOT member workers and employers performing compulsory work. Unlike a general contractor building a hospital, renovators perform many overlapping tasks, such as a bathroom renovation, where they could be performing five or six different trades as part of their work. The previous strict enforcement on the Scope of Practice did not allow for the crossover of work when a tradesperson is performing certain tasks. A risk-of-harm test is an improvement that should direct OCOT enforcement to high-risk areas where there is serious risk to workers and the public. When Bill 119 Mandatory Coverage for Independent Operators came into effect, many contractors were furious about having to pay additional insurance when they already had private insurance covering them on and off the job. Even still, the government provided exemptions for contractors hired directly by the homeowner, recognizing the reality of the sector. More recently, there are new reasons to be positive about the direction of the WSIB. In January 2017, home renovators and new home builders saw an average decrease of 14% in WSIB premium rates, a savings of up to $1,123 per worker annually. While this is a meaningful decrease, there is still the perceived unfairness as a result of a dual-rate structure for residential compared with industrial, commercial and institutional (ICI) construction. Under the present system, a renovator installing a new kitchen for a homeowner pays 87% more than a contractor doing identical work in an office building or a hotel. This is based on an outdated system of rate classes that separates premium rates on arbitrary differences in industry instead of the risk associated with the work. The problem is, these rates have been essentially frozen for the past decade, as the WSIB tries to address its unfunded liability. During this same period, renovators and builders made significant improvements in health and safety and as a result now have equal probability of making a WSIB claim compared to ICI contractors. The good news is that WSIB is slowly moving away from this system and will instead merge most home renovators and home builders with other contractors doing similar work in ICI construction. Called “Rate Framework Modernization,” this change will collapse the current 155 rate groups into 22 different rate classes. For the majority of employers in homebuilding rate group 764 (which includes renovators), the change, once implemented, will create an average savings of more than $2,600 per worker. OHBA is urging WSIB to implement this as soon as possible. Anyone who has purchased a new car knows the fuel economy of the vehicle when they begin shopping. This information is valuable for consumers who are eco-conscious or just want to spend less time paying at the pump. Unfortunately, homebuyers in Ontario do not enjoy the same type of transparency and information when they are purchasing a home. But with the increase of energy costs, understanding a home’s energy performance is now more important than ever. To address concerns about carbon emissions in homes, the government is moving ahead with a mandatory Home Energy Rating and Disclosure program (HER&D), which will mandate that homes be tested for energy performance before being listed for sale. According to the province’s Climate Change Action Plan, this will launch in 2019. OHBA supports the program because this will increase consumer disclosure and transparency. We believe that HER&D could provide the spark for market transformation, as buyers will make informed decisions to purchase more energy-efficient homes. For renovators, this means sellers could be more likely to invest in energy-efficient upgrades prior to listing their home on the market. Behind almost all conversations about government policy affecting renovation are concerns about the underground economy. According to Statistics Canada and the Ontario Ministry of Finance, $16.7 billion in annual economic activity can be attributed to the underground economy in Ontario, of which $4.8 billion is in the residential construction and renovation sector alone. The government has traditionally tried to tackle the underground economy through additional resources for Ministry of Labour enforcement and WSIB non-compliance. However, OHBA members assert that the underground economy is fundamentally caused by consumer demand. If the government wants to get serious about underground activity in residential renovations, more needs to be done to deter consumers from illegal renovations, as well as to privide them with incentives to hire qualified professional renovators. In 2016, the Parliamentary Secretary to the Ministry of Finance, MPP Laura Albanese, led an examination into the problem of the underground economy in Ontario in the residential construction sector. Through consultations with OHBA, our renovator members and the broader construction community, MPP Albanese released a report providing 10 recommendations to the government. Among these are topics OHBA has been advocating for, such as the introduction of incentives for homeowners to hire qualified and reputable contractors for home improvements. While we have yet to see action on a new made-in-Ontario renovation rebate for consumers, we are encouraged by the report’s recommendations. In recent meetings with MPPs and in our advocacy work, OHBA is now connecting our idea for a home renovation tax rebate with both the government’s emphasis on lowering carbon emissions and the HER&D program. There are 4.8 million existing homes in Ontario, and many of these were built in a time when there was no insulation and homes were heated and cooled with older inefficient boilers and heaters. If the government is serious about reaching the Climate Change Action Plan targets, there is a strong case to be made for the government providing funds to homeowners that choose to hire professional renovators to work on projects that make the home more efficient. This highlights a few key issues currently affecting the work of renovators. As we continue to retrofit, upgrade and modernize Ontario’s communities, OHBA will continue to advocate for effective and workable policies that support the work of our professional renovator members across Ontario.